If dirt is left to build-up on wooden furniture it can soon mask the beauty of your favourite wooden chairs, table or cupboards. Of course cleaning the furniture frequently will help, but when the dirt and grime is no longer removed by normal cleaning it’s time to turn to a more powerful cleaning solution. You may already have an off the shelf abrasive chemical cleaner, but do you really won’t to use such on your favourite piece of furniture? Also if the wood is painted or varnished then abrasive chemicals can damage the finish. 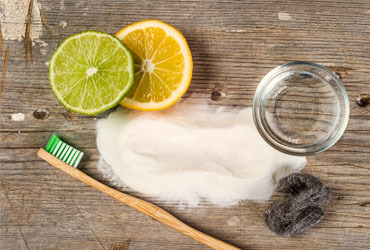 This is when you should try homemade natural cleaning solutions that give you enough power to remove even the most stubborn dirt build-ups and restore the full shine and beauty to your furniture. Old dust sheet for covering the working area. 1) Once you have prepared the ingredients and materials required select an area where you can work that has plenty of room to move around the furniture freely. Working in your garden or garage is often the best place. 2) Once you have chosen the area you shall work cover the ground with an old dust sheet or cardboard sheeting. 3) Place the item of furniture on the centre of the ground covering making sure you have amble space surrounding it so you are able to access all sides easily. 4) Wipe the surfaces of the furniture with a clean soft cloth or duster to remove loose dirt. Take the vacuum and a small nozzle attachment to get into any small corners and crevices. 5) Now you have removed the loose dirt and dust it’s time to mix up the natural cleaning solution, mix two parts olive oil with one part lemon juice and a teaspoon of fine salt. 6) Using another soft clean cloth, apply the cleaning solution sparingly to the wooden furniture, if it is a cupboard you’re cleaning then you may decide to remove the cupboard handles for ease of cleaning. Make sure not to soak the wood with the solution. 7) Gently wipe the solution over all areas of the furniture and where possible wipe the solution in the direction of the wood grain. Continue cleaning until the dirt has gone, taking care not to scrub too hard else you may damage the surface finish. 8) For difficult to reach crevices, corners and patterns you can use the old toothbrush and gently work the solution into these areas. Where possible try to brush within the direction of the wood grain. 9) Once you have removed all dirt, wipe down the furniture with a clean dry cloth removing any of the remaining cleaning solution and allow several hours for the furniture to completely. 10) Once dry, buff using a clean soft cloth to bring back the shine. As with any cleaning product, it is best to try a small amount on a hidden or less visible area of the furniture first, and if you are cleaning antique furniture then check that the cleaning solution is suitable for use with a furniture restoration specialist. If you found this article useful, then watch our how to repair wood scratches video.